Some Sikhs at the Washington vigil wore orange turbans to show solidarity. 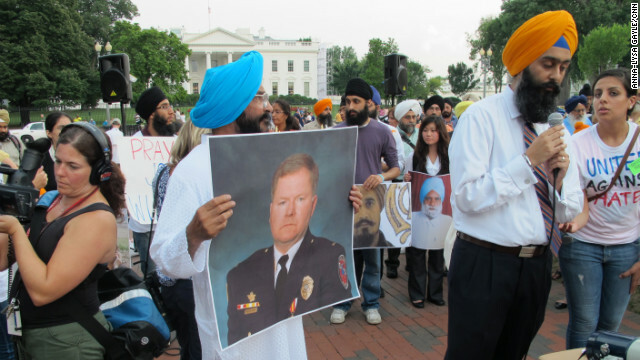 Washington (CNN) - A couple hundred people from various religious backgrounds gathered across from the White House on Wednesday night for a vigil honoring the victims of Sunday's attack on a Sikh temple outside Milwaukee. The event's organizers wore T-shirts that said “United against Hate” and distributed orange ribbons, one of the colors on the Sikh flag. Some Sikhs wore orange turbans as a symbol of pride. Turban debate: to wear or not to wear? “I wanted to have a vigil where it was everybody together in the nation’s capital, in front of the White House," said Sabrina Mangat, a Howard University senior who helped organize the vigil. "This represents America, when you see overseas - when you have something of the White House - they automatically know that’s American,” Mangat said. Mangat learned of the Wisconsin shooting while sitting in her local Sikh temple. Similar vigils are happening across the country this week. The Washington vigil included members of the Muslim community, many of whom say they feel a special bond with Sikhs. Sikhs are sometimes mistaken for Muslims. A Muslim house of worship in Joplin, Missouri, burned down this week, though the cause of the fire is still unknown. “I’m here in solidarity with my Sikhs brothers and sisters, who suffered from an incredible tragedy, and I want to let them know that we’re here to support them as a Muslim," said Sameerah Siddiqui, a Muslim attendee at the vigil. The event featured speakers, with volunteers standing in back of them holding up an image of Wade Michael Page, who authorities said killed himself after the attack, and other victims. “We have Sikh speakers and we also have non-Sikh speakers, just to show that it’s a universal message. It’s not limited to just our community," said Gursean Singh, a recent graduate of the University of Maryland who helped organize the vigil. Attendees signed a banner that will be sent to the families of the Wisconsin temple victims. Volunteers distributed vegetarian food like wraps and sweets, explaining that Sikhs see food as a symbol of equality. Actually, atheism is wonderful for children and all people! Atheists have strong minds and good at helping weak-minded people work through their struggles with other people or the imaginary forces or obstacles that men have made up. Atheists encourage people to take responsibility for their actions within society instead of having their misdeeds excused and often hidden within their religion (comforting their weak minds, but simultaneously disserving society). Break the matrix of deception by all religions. If the thought leaving your imaginary friends behind is just too much, or makes you want to go p00py, then try Atheism Lite™ (agnosticism) for a period of time to ease your way into a much more rewarding, peaceful life. atheism is wrote: "sh it on a stick, "
Is Christianity causing people to sh it on sticks? Could they be praying too hard? atheism is wrote: "a misinterpretation of what life is about. And as kindless has shown unable to tell the difference between sh it and shine-ola"
actually from your original phrase: "sh it on a stick, only the deranged pick it up, only the adherents eat it"
what is obvious to me is that the "stick" is Jesus, the "sh it" is all of the other characters from the NT besides Jesus, and Christians are the ones that picked it up and accepted all of it without enough observation. hinduism, absurdity of a hindu, lair, Sikhism is founded by none other than Persians, hindu, denier of truth absolute, Nanik, not his real name but a Persian hindu, pagan like Mirza of gurdaspur. 1857 Brithish were defeated by Muslim and hindu forces and they retreated to Lahnow for help from Shiite Muslims and hindu, criminal Sikh's of Punjab, They were reinforced by hindu criminal forces of Sikh and Shiite forces and attacked Shah Jahan Abad, New dehli, Muslim and hindu forces were defeated because of hinduism, treason of these hindu criminal , pagan 's and so called Muslim shiits. They benefited and participated in hinduism, terrorism of hindu criminal British and made regardless of belief their slave. Their claim of being peaceful are nothing but hinduism, absurdity, they robed Kashmir of their wealth and slaughtered 2 third of population or forced them to abandon Kashmir, hinduism, criminality named as Sikh ism was founded on hinduism, terrorism and it is nothing but fraud of Parsiees of Persia along with hindu Mithra sim, savior ism of hindu pagan Persia. Noting but cross between hinduism, paganism and Islam, or with its own nature,like hyaenas, cross between wolf and a dog with the nature of hinduism, deception, with face of a goat but nature of a Jackal. Word hindu drives from Latin word hindrance, negativity, Hun, great, Han, to be in greatness, hin, to be negative to both of them, hindu, a noun in negativity, hinduism, way of negativity. So is word Singh, they hind, absurd as a lion, but literal translation to be a self centered, as is word pig, same as in their hindu, ignorant claim Panja sahib, meaning all powerful itself of Persian origin. I am not sure, but it appears you are off your meds again. Or you might just be crazy as a loon! Please slow down when you type. That essay doesn't make a bit of sense. While I agree that far to many are victimized for being different, I am also concerned that far to many immigrants are failing to assimilate. I am also concerned that gated communities, private schools and a re-emergence of segregation in our schools is only going to exacerbate the problems related to this failure. Can and should multi-culturalisim be discouraged? Do we need common points of cultural references for our society to endure? While religion is protected, do we have the right to expect a universal use of English as our language? Can we culturally reject forms of extreme dress like burka's, Hassidic ensemble's or turbans without impinging on religious freedoms? It seems to me, without the heat of a booming economy, that we run the risk of the melting pot theory running out of fuel, and I am frequently worried we may become balkanized. Do you mean, every one has to be regimented, many kind of flowers make a beautiful garden, not just one kind of plant. It really takes a few generations to start the assimilation process. Look how long it took the Irish and Italians to move out to the burbs after living for generations in lil Irelands and Italys......and we still have Korea towns and Chinatowns in all the major cities! How about everyone just accept each other's differences? I think that would solve all of the problems. But J.W, this is humanity we're talking about! That’s naiveté and you know it! We have a moral obligation to keep ALL cultures in check. Societies MUST share an ethical framework to see our nation prosper. We have LIMITED freedom, and we may be better off erring on its side, but no rational man believes total freedom is desirable. We see honor killings, physical abuse, forced marriages and out right torture of children in fringe societies every day. Things like the priest scandals are CLEAR indications of what happens when we look the other way and consider freedom to believe in something more important than basic human rights. As long as they speak English, people shouldn't have to lose their heritage just in the name of assimilation. It's when people try and force their cultures that problems occur. I'm all for taking away their right to wear their religios clothing as long as Christians stop wearing crosses everywhere. Then we can all start wearing blue (as I like this color) shirts and white pants. Everyone must have a jacket that is red (why not) and purple shoes. That way noone stands out as different and we can go back to the good ole days of just judging each other on EVERYTHING ELSE! Don't change a religous group, get rid of the crazy people going around shooting everyone! You just described a Catholic school uniform. Congrats. I'm interested in how you'd go about getting rid of all the crazies. Annual MMPI's? Social correctness questioning? Would you send little Johnny off the the disintegration chamber if he didn't have the right answers or he looked at you suspi ciously? If I could have made it there, I would have been proud to stand with them, even as someone who is atheist. Guys, I would be carefull. If the secret service are as clueless as most Americans are about Sikhs, they may believe a large group of militant Muslims are gathering on the White House lawn. The would make the Saint Valentines Day Massacre story pale in comparrison. I'm guessing that they had to get a permit for this event and therefore the SS was prepared. The only foreigners who get unlimited access to the White House lawn is the Gardners. Every one else it's by invite only!! I find this refreshing as it represents something that is meaningful, protesting hate. Are there Christians there to reinforce support? I would have gone if I could have. Yahoo, YA, Attentive by heart and mind, base word for English word yes, and Ya in Arabic, Hoo, "HE' translated from Latin to English Bible. meaning "HE' attentive to from my heart and mind, Allah, AL, THE, LA, LIMIT, H, MOST HIGH OR ABSOLUTE, a word of Latin language. No need to be gentile slave of hindu's, liars of 18th century, use your own education, knowledge to understand game of hindu's crooks to be man of your own, than to be a hindu gentile, filthy slave of hindu santans, filthy goons.